SALZBURG (AUSTRIA) (AFP) – French President Emmanuel Macron said Wednesday that an EU rule allowing companies to send temporary workers from low-wage countries to other member states without paying local social charges was a “betrayal of the European spirit”. “The European directive on detached workers in its current format is a betrayal of the European spirit,” Macron said in Salzburg at the start of a diplomatic blitz through eastern and central Europe. 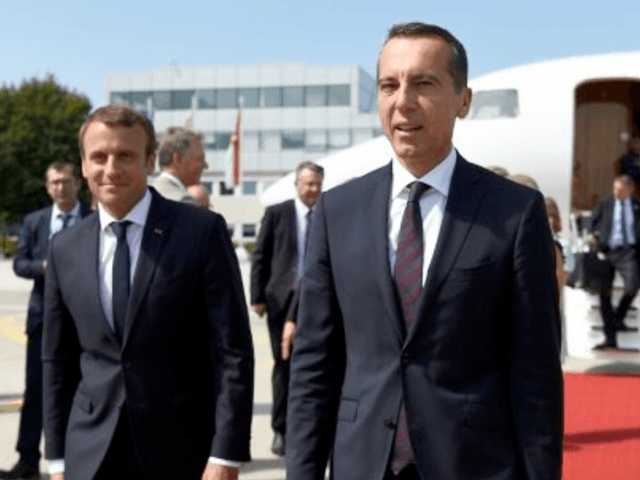 “Austria and France are on the same wavelength,” he told reporters at a press conference with Austrian Chancellor Christian Kern. The EU rule has come under fire from critics in rich countries, who say it amounts to “social dumping” in which payments to health and welfare systems are avoided. Faced with faltering ratings at home, the French president seeks to drum up support for a plan to overhaul the controversial rule during his three-tour through Austria, Romania and Bulgaria. Later Wednesday, Macron is set to hold talks with Kern and the leaders of Slovakia and the Czech Republic in Salzburg.